Playful, elegant and loyal, Orientals have big personalities, to match the vast range of colours and pattern that can be found in this breed. There are over 300 varieties, which has earned the breed the nickname Ornamental. With sleek bodies, an angular face and large flaring ears, this cat is both graceful and very distinctive. 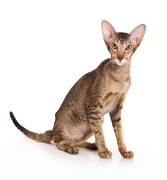 There are 2 types of Oriental cats – the Oriental Shorthair and the Oriental Longhair. The main different is that the Longhair Oriental features a recessive gene for longer fur. Oriental cats all have green eyes, except for the white variety, which can have green eyes, blue eyes, or one of each. Orientals are very attached to their humans and always want to know what’s going on. They are intelligent and, combined with their natural sense of curiosity, they make great partners for budding explorers, but make sure you don’t leave them alone where they can empty out the content of your bag or drawers! This breed has no specific health issues and usually enjoys a long life span. They are very athletic and can jump to great heights. However, it is advisable to clean the cat’s teeth regularly and have annual liver and kidney function checks from when the cat reaches the age of 8. By joining this group, you club together with other owners of Oriental Cats to get a great deal on insurance for your affectionate feline.